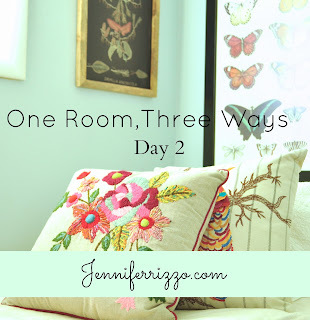 A Modern Bohemian room ….One Room, Three different ways day 2…..
Hey everyone! Welcome to day 2 of One room, Three different ways!!!! 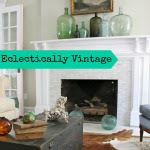 This has been such a blast seeing how everyone is restyling their spaces! 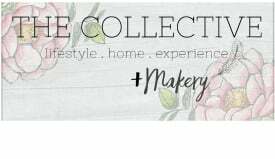 Don’t forget you can join in on Friday with our linky party!! Yesterday I went for a calm, restful retreat. Today I decided to go for COLOR! I love botanical and color so I blended the two into what I am calling Modern bohemian naturalist. 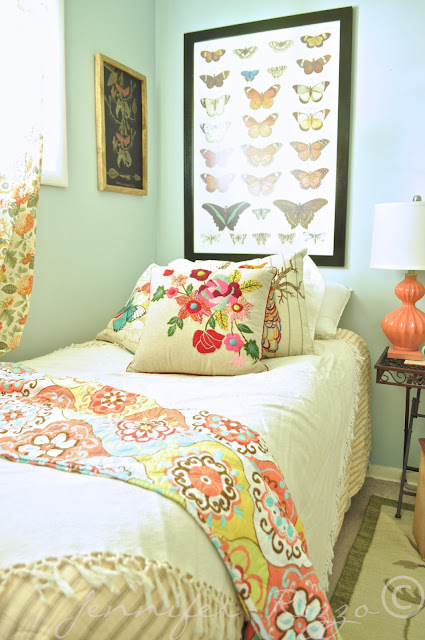 Lots of fun textures, colors and patterns with some handmade looking touches. Here is the original room. 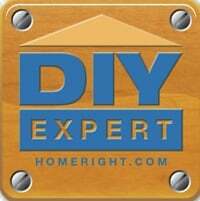 Here is my restyled space!!! It was fun to put together something different! I pulled out the head board and added a big print from Ikea for $12! 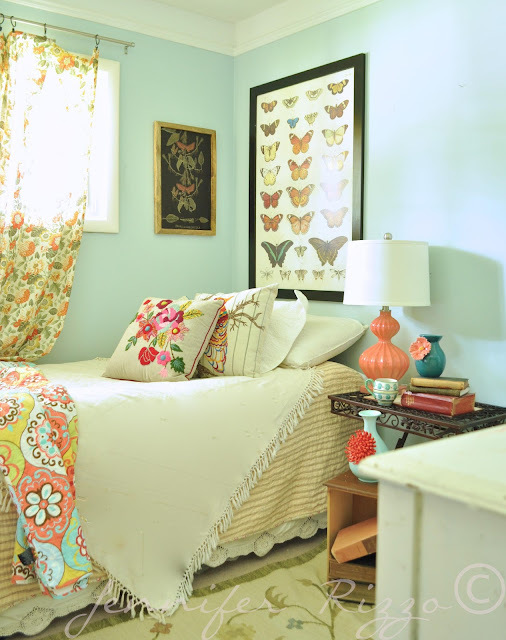 I kept the same bed spread and covered it with a table cloth and then threw one of the kid’s quilts on top of it. I grabbed a lamp from my bedroom and my Anthro vases and a mug from around the house. The drawer is from an old dresser I use for storage in the garage and can you tell I gathered every old book I own? 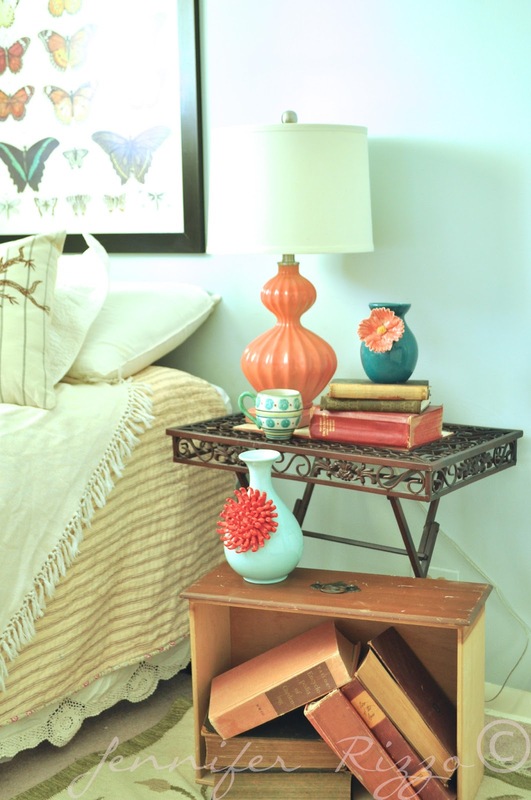 The metal side table is for the outdoors, but it actually resides in my family room. 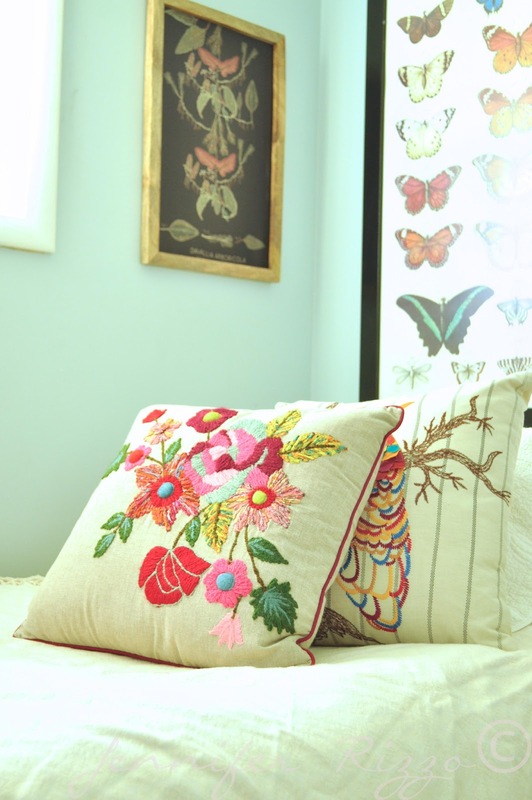 I bought these pillows for our bedroom ages ago from Homegoods, it’s a bit of boho chic in there too. I love all of the color and textures! I adore that big print. The smaller black print from Target is from my living room. I hope you loved my boho naturalist look! You can see my day 3 here. 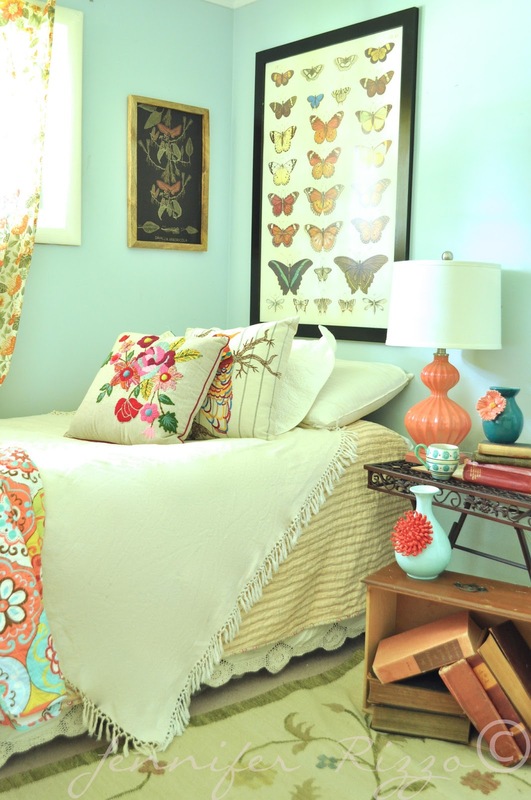 For more restyled looks, you can visit these other amazing ladies and their spaces! ok so i loved yesterday, but this!!! this is so me! love it! I LOVE it! This room is calling my name with all the color and texture. This is so cute Jen! I’m so glad you all are doing this — we’re having company next week, and my entire house is torn apart, so I’m playing right along with you all 🙂 Good stuff! 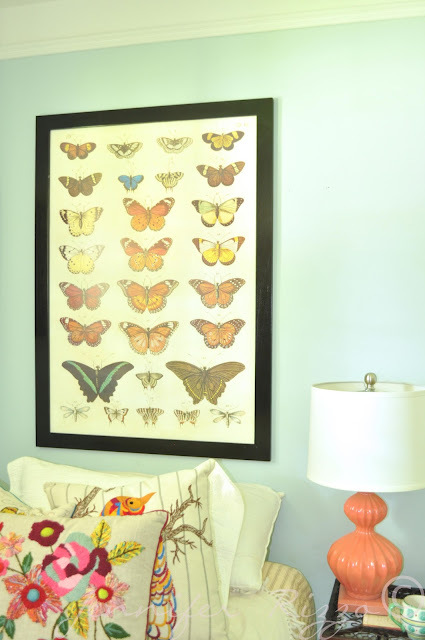 I adore those embroidered pillows and that butterfly print – Ikea is great for cheap art! 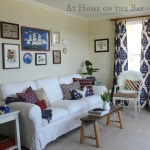 Another fabulous room – I may just have to come and stay!!! That butterfly art is the perfect headboard replacement! 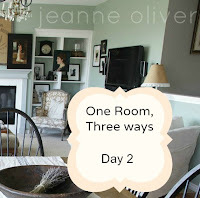 I fell in love with yesterday’s retreat, but this space is so fun and spunky! Love it! This is my favorite so far!!!! LOVE the little bits of coral and that print from IKEA….amazing! Oh! I like this one the best so far! Great mix of colour and pattern and that butterfly print makes the coolest bed head. I dont know which one I like better! You did a great job with both designs, I can’t see how you can pull of a 3rd one!!! Love it! I love the colors and patterns! Beautiful! 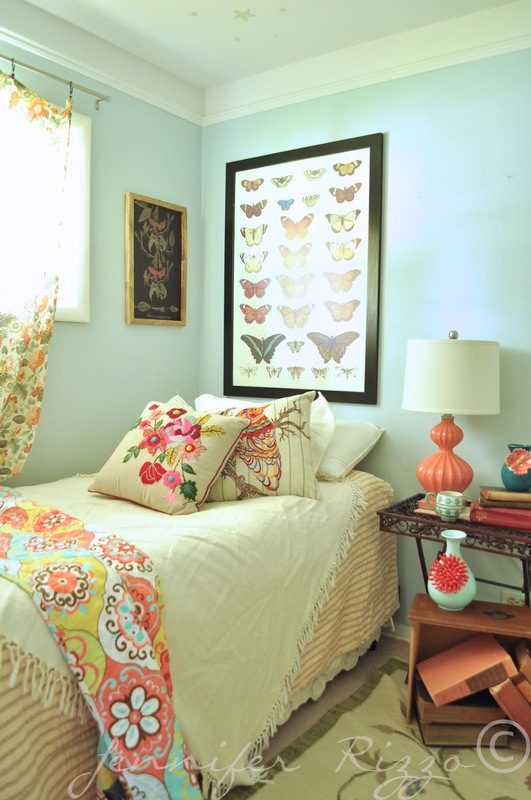 The butterfly print looks great above the bed. I like the naturalist theme mixed with these beautiful colors and textures! i love this room!!! this has to be my favorite yet!! i cant never seem to pull a room together. my rooms always look half done… lol. this is so neat!!! 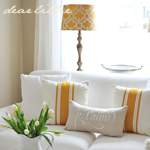 Gorgeous, those pillows pull me right in. Just adore the peek of that pretty linen on the bottom of the bed. Is that vintage? Yum! I love this look! So cute! Great job with it! Love the feel of this one, Jen! 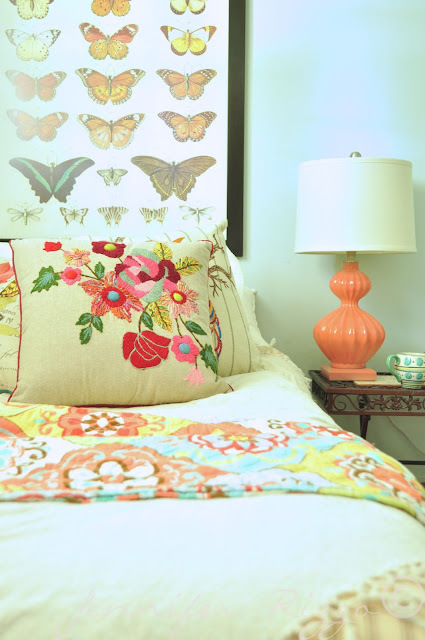 And LOVE those pillows! Please, please, please what is the wall color. It’s exactly what I want. Hi Lesta,It’s Sea salt by Sherwin williams, but it does photograph slightly different, so I would try a test patch first.